From debonair racecar drivers to female impersonators, modernist architecture to children living in caves, revolutionaries to showgirls, I WAS CUBA by Kevin Kwan is a riveting and highly original look at Cuba through the Ramiro Fern?ndez Collection, arguably the largest private archive of photographs from Cuba. Conceived and curated by the acclaimed creative director Kevin Kwan, I WAS CUBA showcases over 300 NEVER-BEFORE-SEEN images.? Assembled over the past three decades by Ramiro Fern?ndez, the collection spans more than one hundred years of photography and is unique in its focus on the unusual and the vernacular. I WAS CUBA showcases these exceedingly rare images in a bold visual narrative? ?dream journey? that weaves together the history of the island with biographical elements from Ramiro Fernandez?s life.? There is no other book where the elements of glamour, history, and pop culture are woven together in this cinematic fashion ? the book itself becomes a conceptual art piece.? The book is further enhanced by the writings of Reinaldo Arenas, one of the giants of 20th century Cuban literature.? Arenas was a friend of Ramiro?s in the mid 1980s, and always intended on writing for this book.? Today, his text, much of it never-before-published, is thoughtfully woven throughout the book.? The book ends with an engrossing interview with Ramiro Fern?ndez by People En Espa?ol managing editor Peter Castro. While most think of Cuba as a mythical island of rum, rumba, and revolution, period photographs reveal a more complexplace. I Was Cuba is an original look at Cuban history as seen through the Ramiro Fernandez Collection—arguably the world’s leading archive of Cuban photos and ephemera. I Was Cuba showcases rare, vernacular images from the nineteenth century through the revolutionary period, exploring the everyday and the eccentric. With texts from famed Cuban writer Reinaldo Arenas (Before Night Falls), this captivating volume is an intimate view into a bygone era of glamour, political upheaval, and astounding visual culture. Ramiro Fernandez was born in Havana to a family involved in the pharmaceutical industry. He left Cuba in 1960, settling first in Palm Beach County and then in New York, where he was a photography editor at Time Inc. for 25 years, working for such titles as Entertainment Weekly, Sports Illustrated, People, and People En Espaol. Fernandez first began to collect at the suggestion of his grandmother, who foresaw the coming turmoil and urged him to collect images of a Cuba that was fast disappearing. As a witness to the revolution in his youth, Fernandez’s consuming passion has been to build a collection that can serve as a testament to the Cuba he remembers. Cuba is a cascade of random, off-guard images in the mind of Ramiro Fernandez, veteran photo editor and self-described “visualist”: It is an insider’s view of the gilded-cage elevator that rose to his grandmother’s penthouse apartment atop Havana’s Hotel Telegrafo. It is the pet monkey she kept on the roof. It is the spellbinding view from her balcony, overlooking the Parque Central, the city’s main square. 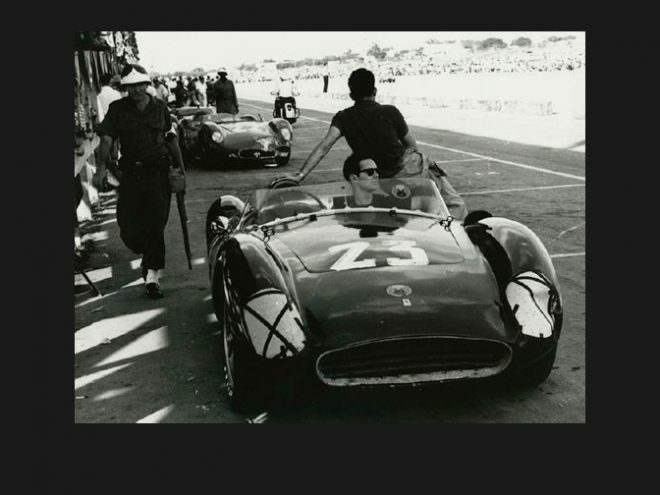 It is a glimpse from inside a racing pit at the Havana Grand Prix. It is the alien-like streetlights dotting the Via Blanca coastal road. It is a childhood friend named Alina standing on the Havana sea wall in her gingham-ruffled swimsuit. It is the blur of the ocean as seen from the passenger’s seat of his mother’s sporty Karmann Ghia. Fernandez, a West Palm Beach-raised Havana native, is an art historian and a photo editor of 25 years with various Time Inc. magazines. But more important, he is a collector of vintage Cuban photographs, images captured over the course of a century, from the 1860s to 1965. His collection, which includes more than 3,000 works, is considered to be the most extensive private collection of Cuban photography in the world. The book itself is a visual feast of street scenes, portraits, cityscapes, rural panoramas and historical snapshots. There are, of course, the famed rumba dancers of the 1950s, the national and the visiting divas, like Cuban rumba queen Celia Cruz in 1954, American jazz-age legend Josephine Baker in 1951, Argentine tango singer Charlo in 1930, Cuban female impersonator Bobby de Castro in 1958. There are the sportsmen, the dashing Cuban-American Olympic fencer in 1910, the Havana polo team of 1915, the rural cockfighters of 1930, the Cienfuegos rowing champions of 1952, the oiled bodybuilders of the 1950s, the boxing stars, Kid Chocolate in 1933 and Antonio “Puppy” Garcia in 1953. There are the hardscrabble farmers of the late 1800s, the Chinese field workers in 1905, the sugar-cane cutters in 1956. And there are the most enduring of Cuban protagonists – the royal palms, guavas, mangos and ceiba trees in all their majesty. It is a collection Fernandez began in 1981, when he was working a temp job at the Museum of Modern Art in New York. He met an art dealer there who showed him his Cuban pictures. Fernandez was taken by the work of Jose Gomez de la Carrera, a noted photojournalist from late 19th-century Cuba, and purchased an album of 20 photographs printed in the vintage-era technique that used an egg-white emulsion. One of those early images of Havana’s Parque Central brought back a rush of memories – of visiting his grandmother at the hotel she called home: a Bohemian gathering place of parlor conversations, people-watching and communal meals shared by artists, writers and retirees. Cuca Machado, the dear family friend he called his grandmother, was a free-spirited woman who filled his childhood afternoons with the colors and aromas of 1950s Cuba. She married a boulevardier (man-about-town), wore bold and mysterious perfume, Mitsouko by Guerlain, and, yes, kept a pet monkey. But those sights locked into his memory are more than just images of an island. They are heartbeats of daily life. Years into his collecting, Fernandez found one particularly haunting photograph that sent him back to a time in the 1950s when everyone in his Havana seemed obsessed with potential invaders from Mars. The photo, a rather spooky shot of a string of modernistic, X-shaped streetlights blurred alongside the ocean, is not your quintessential image of a Cuban beach. There’s not a palm tree in sight. But Fernandez jumped at the sight of the 1958 photograph. “These were my space invaders when I was a child. These were my visual toys on nights when we drove east toward Varadero beach,” he says. As his career thrived, so did his photo collection. For him, it became a visual journey not only into his childhood but also into a Cuba he didn’t know. Through the images, he traced historical trends and cultural nuance. He feasted his eyes on his favorite decade, the 1950s, and studied the abrupt change in Cuban photography a decade later. For instance, Fernandez found a rather skewed photograph of the Argentine rebel fighter and executioner Che Guevara. Here, he is not the ubiquitous beret-topped icon. He’s a random face hidden behind a row of microphones. “These pictures ended up in files that people have been taking out of Cuba for years. They’re certainly not the images sanctioned by the government,” says Fernandez. The strength of the collection is its attention to “the unexpected and the vernacular … off-the-cuff images that reveal something more immediate, more intimate about the place,” writes Kwan, the creative director who helped shepherd the book, in the introduction. A Singapore native who also left his island home as a boy, Kwan says he felt an instant connection to the photographs.